The prognosis for patients with oral squamous cell carcinoma remains poor in spite of advances in therapy of many other malignancies. Early diagnosis and treatment remains the key to improved patient survival. Because the scalpel biopsy for diagnosis is invasive and has potential morbidity, it is reserved for evaluating highly suspicious lesions and not for the majority of oral lesions which are clinically not suspicious. Furthermore, scalpel biopsy has significant interobserver and intraobserver variability in the histologic diagnosis of dysplasia. There is an urgent need to devise critical diagnostic tools for early detection of oral dysplasia and malignancy that are practical, noninvasive and can be easily performed in an out-patient set-up. Diagnostic tests for early detection include brush biopsy, toluidine blue staining, autofluorescence, salivary proteomics, DNA analysis, biomarkers and spectroscopy. This state of the art review critically examines these tests and assesses their value in identifying oral squamous cell carcinoma and its precursor lesions. In a recent report from the American Cancer Society, it was estimated that 36,540 new cases of oral cavity and pharyngeal malignancies are likely to be diagnosed in the United States during 2010, and 7,880 patients will die of the disease. In developed countries like the United States, the five year survival was 63% between 1999-2005 - an increase from 53% during the time period from 1975-77; this difference was found to be statistically significant. The improved survival rates may be partially explained by the increasing use of newer diagnostic modalities that detect the disease in its precursor stage and/or use of newer chemotherapeutic options. There are two approaches in the early detection of oral dysplasia and cancer: 1) oral cancer screening programs that identify asymptomatic patients with suspicious lesions and 2) employing specific diagnostic tools to identify dysplasia and early oral cancers in asymptomatic patients with an oral abnormality. The benefits and limitations of these approaches will be addressed in this review. Screening for oral cancer implies searching for oral precancerous and cancerous lesions, typically before symptoms occur. A number of established cancer screening programs for a variety of malignancies have been shown to significantly reduce patient morbidity and mortality - including the Pap test for cervical cancer and mammography for breast cancer. However, several publications have demonstrated that oral cancer screening has limited value as a method for detecting precancerous or early cancerous lesions. In the only randomized controlled oral cancer screening trial conducted in India and involving over 130,000 individuals, the authors concluded that visual examination was useful as a method of screening for oral cancer only in high risk cases like chronic smokers or alcoholics . Oral cancer screening is fraught with problems including the fact that approximately 5-15% of the general population may have an oral mucosal lesion. While the majority of these lesions are benign, clinical inspection alone cannot differentiate which lesions are potentially precancerous and cancerous and which ones are benign. The classic clinical presentation of a premalignant lesion or malignancy includes a red spot, white spot or persistent ulcer. However, only a small percentage of these types of lesions are cancerous and an oral examination unfortunately cannot discriminate between lesions that are potentially dangerous from lesions that are benign. A Cochrane review on this subject failed to find any evidence to confirm or refute the usefulness of screening for oral malignancies . Early detection of oral cancer is one of the most efficient ways to reduce the high mortality from this disease. Early detection can minimize the morbidity of the disease and its treatment, which is associated with a severe loss of function, disfigurement, depression and poor quality of life. However, based upon the National Cancer Institute's SEER program, which collects data on oral cancer, there has been little or no change in the past twenty years in the detection of oral cancers at early stages . Unfortunately, most patients are diagnosed with advanced stage disease. Early detection therefore necessitates raising awareness in the general public and improving access to oral health services for all segments of the population. Oral squamous cell carcinoma (OSCC) is almost always preceded by a visible precancerous lesion-dysplasia. As highlighted by the American Dental Association, "Identifying white and red the spots that show dysplasia and removing them before they become cancer has proved to be one of the most effective methods for reducing the incidence and mortality of cancer" . Malignant transformation of dysplasia, which is quite unpredictable, occurs over years - during which time the lesion can be treated, potentially preventing oral cancer from developing. Oral precancerous lesions may also occasionally regress if the healthcare professional motivates the patient to reduce the risk factors including elimination of carcinogens including tobacco and alcohol. A number of light-based oral cancer screening aids have been developed and aimed at assisting in the identification of precancerous and cancerous lesions at their earliest stage. (Table 1) Specifically, these aids are intended to be used as adjuncts to the conventional oral cavity examination to help visualize lesions. Vizilite Plus with TBlue system (Zila Pharmaceuticals, Phoenix, Arizona, U.S.), VELscope (LED Dental, White Rock, British Columbia, Canada) Microlux/DL (AdDent Inc, Danbury, Connecticut) and Orascoptic DK (Orascoptic, Middleton, WI) are commercially available light-based systems that are based upon the assumption that abnormal metabolic or structural changes have different absorbance and reflectance properties. The various diagnostic modalities for oral cancer detection. VELscope is a handheld device that uses visible light in the 430 nm wavelength in order to cause fluorescent excitation of certain compounds in the tissues. (Figure 1a) With Vizilite, patients' first rinse with acetic acid and then the oral cavity is examined with an illuminated chemiluminescent light stick. (Figure 1b) Microlux is similar to Vizilite and requires the patient first rinse with acetic acid; the oral cavity is then examined with a battery-powered fiberoptic visible light source instead of a chemiluminescent visible light source. Orascoptic DK also requires an acetic acid rinse and uses a three-in-one device that employs a battery-powered handheld light source. Since none of these medical devices is a diagnostic test, the manufacturer of these screening aids do not make any claim that the device is either sensitive or specific to the identification of any type of abnormal oral lesion. Furthermore, as we reported in a prospective study examining the potential benefits of several of these lights, the sensitivity of Vizilite was 0% and the sensitivity of VELscope was also poor-50%. We concluded that the use of ViziLite or VELscope along with a conventional screening examination was not beneficial in identifying dysplasia or cancer and clinicians/and patients could have a false sense of security after obtaining a negative ViziLite or VELscope examination result because potentially large numbers of precancerous and cancerous lesions would be missed by both. Until additional studies are performed, these screening lights should only be used to help identify lesions that may have been overlooked with a conventional oral examination and not for determining whether a lesion is precancerous or cancerous. Only a definitive test examining cells or tissue can determine the biologic behavior of a lesion . a) Velscope, b) Vizylite with toluidine blue staining, c) Patented brush used for oral brush biopsy test, d) Automated DNA ploidy. During the last few decades, oral cytology has resurfaced as the focus of scientific research. However, in contrast to the sampling of cells of the uterine cervix, analysis of surface epithelial cells of the oral cavity and oropharynx by standard exfoliative cytology has proven unreliable so far. The shape of the oral cavity makes it impossible to examine the complete mucosal surface. Without loss of minimal invasiveness, it was not possible to access the deeper cell layers of the oral cavity with conventional exfoliative cytology. During the 1980s, a brush was introduced for cervical smears in gynecological lesions and was later modified for oral smears too. (Figure 1c) This technique demonstrated better cell spreading on objective slides compared with smears obtained by using the conventional wooden spatula as well as an improvement in the cellular adequacy of the smears. The importance of oral brush biopsy was emphasized in a multicenter study where nearly 5% of clinically benign-appearing oral mucosal lesions were sampled by using this technique and later confirmed by using scalpel biopsy to represent dysplastic epithelial changes or invasive cancer . OralCDx® (OraCDx Laboratories, Inc. Suffern, NY), the oral brush biopsy with computer assisted analysis, is a diagnostic test that identifies dysplasia in common spots that often have no suspicious clinical features. Unlike exfoliative cytology, the brush biopsy collects cells from the full thickness of the oral epithelium. The brush biopsy is a chair-side, easy to perform, painless test that can be used to evaluate any suspicious lesion including common small white and red oral lesions to rule out dysplasia. Since most oral lesions are benign, most test results are likely to be benign. Approximately 10% of all cases usually turn out to be abnormal. Based upon the findings, the laboratory provides specific guidance on these abnormal cases sometimes recommending scalpel biopsy, retesting or observation. The accuracy of the brush test has been the subject of many published studies. In every study in which an oral lesion was simultaneously tested with both a brush biopsy and scalpel biopsy, this test has been shown to have a sensitivity and specificity well over 90% [8, 9]. These studies demonstrate that the brush biopsy has a high sensitivity in ruling out the presence of dysplasia and cancer making it a practical way to evaluate lesions without an obvious etiology such as infection of trauma. Discrepancies of brush test and scalpel biopsy results have been reported anecdotally and have incorrectly been labeled brush "false negatives." Unfortunately these anecdotes been quoted repeatedly in the literature despite the fact that they have no validity at all. These discrepant results were all from cases where the scalpel biopsy was performed months after from the brush biopsy. Within a given oral lesion, dysplasia is multicentric and unless the 2 biopsy samples happen to sample the same part of the dysplastic lesion, the results will be discrepant. Furthermore, the biologic nature of a lesion may change over time as benign lesions may become dysplastic and dysplasia may also regress. Most importantly, the histologic diagnosis of dysplasia is not easily reproduced amongst oral pathologists and therefore a discrepant result between brush biopsy and scalpel biopsy may in fact represent a false negative or false positive scalpel biopsy result. Therefore, when comparisons are made between any 2 biopsy techniques (i.e. brush biopsy vs. scalpel biopsy or scalpel biopsy vs. scalpel biopsy) the only valid studies are those which compare the results of both biopsies performed at the same time and from the same portion of the suspicious lesion. 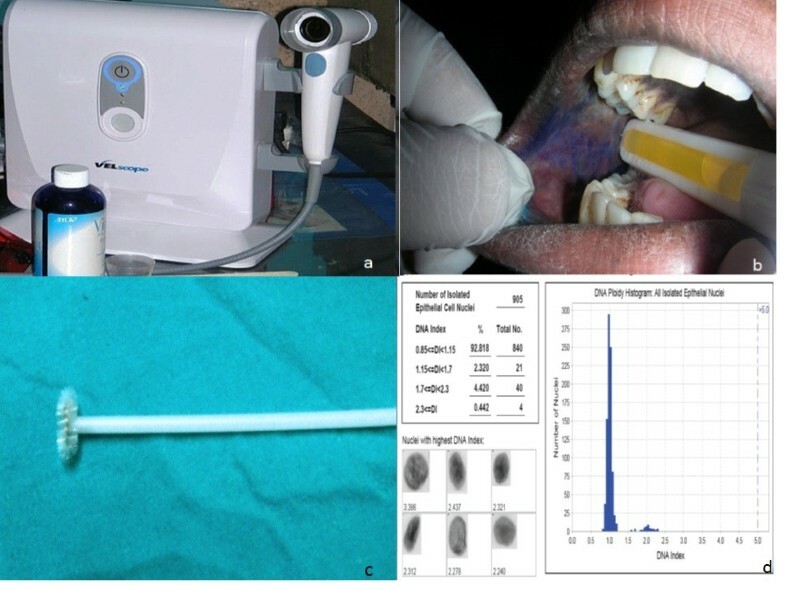 To help localize the optimal site for brushing an abnormality, Gupta et al combined conventional oral brush biopsy with the application of toluidine blue to localize suspect mucosal areas . Until now, tissue sampling by scalpel biopsy and subsequent histological examination have been the cornerstone for diagnosing premalignant and malignant oral diseases. Unfortunately, scalpel biopsy has many inherent limitations which health care practitioners need to be aware of. For example, vague histopathological definitions as well as histological misinterpretation resulting in false negatives and false positives should be kept in mind while interpreting the results of scalpel biopsies. An oral biopsy is invasiveand involves both psychological implications for the patient as well as possible often technical difficulties for the health practitioner. When lesions are extensive, the most representative areas must be selected to avoid diagnostic errors. Oral biopsy specimens can be affected by a number of artefacts resulting from crushing, fulguration or incorrect fixation and freezing. There is a long standing controversy regarding selection both of the technique (incisional versus excisional) and of the surgical instruments used to avoid artefacts; punch biopsy may have some benefits . Experimental studies have detected an increased frequency of neck metastasis from stage I and stage II OSCC after incisional biopsy and the presence of tumour cells have been noticed in the peripheral blood 15 min after incisional biopsies using a conventional scalpel[14, 15]. Consequently, it has been hypothesized that the use of a laser beam to obtain biopsy material could minimize seeding of cells but studies are needed to support this theory. The limitations of comparing 2 biopsy results performed at different time has been highlighted in a study of 200 patients with leukoplakia, who underwent scalpel biopsies at different times with an agreement rate between two scalpel biopsies of only 56%. In addition, clinicians should be aware of possible under diagnosis after incisional biopsy-particularly in cases of "hybrid" forms of OSCC and non-homogeneous lesions, depending on the site where the biopsy is performed[17, 18]. A number of histological characteristics of the primary tumour, such as the grade of malignancy and depth of invasion, have been shown to have prognostic value in terms of tumour recurrence, lymph node involvement, and cause-specific survival hence, it is important for an incisional biopsy to be of sufficient size and depth to include part of the advancing margin of tumour. Ideally, the deep margin should be included, but if this is not possible (e.g., in large tumours), the peripheral margin is often sufficiently representative to allow provisional assessment. Finally, a high inter- and intraobserver variability in histologically diagnosing dysplasia has been described by many authors. The difficulty of accurately diagnosing dysplasia and reproducing those results can have significant implications for patients who are provided with false positive and false negative scalpel biopsy results. As already highlighted in this review, when two scalpel biopsies are performed at different times by different examiners, the agreement rate between them was only 56%. It is evident that even incisional biopsies of suspicious lesions which have a limited reproducibility may, at times, result in a more or less aggressive surgical and/or radio-chemotherapeutic approach. Toluidine blue (TB) staining is claimed to be a simple, inexpensive and sensitive adjunct tool for identifying early OSCC and high-grade dysplasias . When a 1% aqueous TB solution is applied to a suspicious lesion for 30 seconds, this acidophilic metachromatic nuclear stain helps to differentiate areas of carcinoma in situ or invasive carcinoma from normal tissue. Although TB has been found to be highly sensitive and moderately specific for malignant lesions, it is far less sensitive for premalignant lesions with false negative rates of up to 58% reported for identifying mild-to-moderate dysplasia [10, 21]. Toluidine blue has also been demonstrated to help assess the status of margins around oral cancer at the time of resection . Although toluidine blue test is helpful in identifying oral cancers, it should not be viewed as a substitute for biopsy, and a negative test does not preclude the presence of dysplasia or even oral cancer. Laser capture microdissection (LCM) has made the study of cancer biology more precise and has greatly boosted the efforts in defining the molecular basis of malignancy . LCM provides an ideal method for the extraction of cells from specimens in which the exact morphology of both the captured cells and the surrounding tissue are preserved. When rapid immunohistochemical staining techniques are combined with LCM, more accurate microdissection of cellular subsets can be obtained . LCM may be also used to detect the biomarkers and establish protein fingerprint models for early detection of OSCC. LCM combined with SELDI-TOF-MS technology and bioinformatics approaches may not only facilitate the discovery of better biomarkers but also provide a useful tool for molecular diagnosis [25, 26]. DNA image cytometry measures ploidy status to determine the malignant potential of cells. After staining with Feulgen dye, the cytological samples are compared with a reference group of cells. A computer-assisted analysis has been recently designed to identify deviations of cellular DNA content. Genomic instability contributes towards cancer development, and abnormal DNA content may distinguish the dysplastic lesions that might progress to cancer (Figure 1d) . Several studies confirm the usefulness of DNA ploidy analysis as an adjunct to conventional cytology assessment of cytobrush samples for detection of oral cancer [27–30]. An increase in sensitivity and specificity of oral brush biopsy to 100% has been reported [29, 31]. Multimodal cell analysis (MMCA) and mechanical phenotyping have been used for early detection of oral malignancies [32, 33]. Oral brush samples were examined to detect non-diploid cells (NDC) combined with morphological and cytogenetic analysis. It has been suggested that the combined morphological and cytogenetic analysis of cells collected by a non-invasive brush may enable early detection of potentially malignant cells . In a study, Bremmer et al have investigated allelic imbalance in brushes from 25 patients with leukoplakia and reported genetic changes in 40% of these patients as compared to none in controls, yielding a sensitivity of 78% and positive predictive value of 100% . Saliva testing, a non-invasive alternative to serum testing, may be an effective modality for diagnosis, determining prognosis of oral cancer and for monitoring post-therapy status. Saliva, as a diagnostic tool, has many advantages over serum, aside from the ability of being collected non-invasively. Saliva may provide a cost-effective and practical approach for the screening of large populations. It may be used to measure specific salivary macromolecules as well as examining proteomic or genomic targets such as enzymes, cytokines, growth factors, metalloproteinases, endothelin, telomerase, cytokeratins, mRNAs and DNA transcripts [36–38]. The six most studied epithelial serum circulatory tumor markers in the saliva of carcinoma patients are Cyfra 21-1, TPS, carcinoembryonic antigen (CEA), SCC, CA125, and CA19-9. Significant increase (of 400%) in salivary concentrations of Cyfra 21-1, TPS and CA125 were shown with sensitivity, specificity, and negative and positive predictive values of 71%, 75%, 71%, and 75%, respectively. On the other hand CEA, SCC and CA19-9, did not reach statistical significance[30–41]. CD44, a multi-structural and multifunctional cell surface transmembrane glycoprotein molecule has also been detected in saliva. Broadly, microfluidics technology -also referred to as lab-on-a-chip or micro-total-analysis systems (TAS)-is the adaptation, miniaturization, integration, and automation of analytical laboratory procedures into a single device or "chip." Microfluidics is often regarded as the chemistry or biotechnology equivalent of the silicon integrated circuit chip that has revolutionized electronics, computers, and communications. The detection of oral dysplastic and cancer cells within the chip utilizes membrane-associated cell proteins that are singularly expressed on the cell membranes of dysplastic and cancer cells as well as their unique gene transcription profiles . Spectral cytopathology (SCP) is a recently developed technique for diagnostic differentiation of disease in individual exfoliated cells. Papamarkakis et al carried out SCP by collecting information on each cell's biochemical composition through infrared micro-spectral measurement, followed by multivariate data analysis. Deviations from a cell's natural composition produced specific spectral patterns that were exclusive to the cause of the deviation or disease. These unique spectral patterns were reproducible and analyzed through multivariate statistical methods to detect cells in dysplasia, neoplasia, or viral infection at the molecular level . Multispectral digital microscope (MDM) has also been utilized as a tool to improve detection of oral neoplasia. MDM acquires in-vivo images in different modes i.e. fluorescence, narrow-band (NB) reflectance, and orthogonal polarized reflectance (OPR) to enable evaluation of lesions . Poh et al studied 122 oral mucosal biopsies, 20 surgical specimens and assessed the fluorescence visualization (FV) status, histology and loss of heterozygosity. They concluded that direct visualization of subclinical field changes around oral cancers, documenting alterations in fluorescence and direct FV can identify subclinical high-risk fields with cancerous and precancerous changes in the operating room setting. Autofluorescence and chemiluminescencehave been studied as non-invasive in-vivo tools for the detection of (pre-)malignant tissue alterations. Autofluorescence of tissues under excitation with light is produced by several endogenous fluorophores. It was reported that autofluorescence spectroscopy may provide valuable information for diagnosis and monitoring the therapeutic response in oral submucous fibrosisand should be validated with more studies involving large samples and longer follow-up[47, 48]. The wavelength of absorption is affected by changes in blood content and oxygenation, which are the signs of disease due to altered tissue metabolism or neovascularization. Diffuse reflectance spectroscopy (DRS) has been studied as a non-invasive in-vivo tool for the detection of (pre)malignant tissue alterations. In another study, the DRS ratio of oxygenated hemoglobin bands at 545 and 575 nm was used for grading of malignancy. A sensitivity of 100% and specificity of 86% for differentiating dysplasia from hyperplasia, and a sensitivity of 97% and specificity of 86% for discriminating hyperplasia from normal was obtained . Pavlovaet al reported that examining oral lesions with optical tools may result in a loss of fluorescence intensity and may fail to distinguish benign from precancerous lesions. Optical coherence tomography (OCT)is a non-invasive tomographic imaging modality to detect areas of inflammation, dysplasia and cancer. OCT records subsurface reflections to build a cross-sectional architectural image of tissue. Contrast in these images may be enhanced by utilizing surface plasmon resonant gold nanoparticles. It was concluded that this multimodal delivery of antibody-conjugated Polyethylene glycol linked gold nanoparticles enhances the contrast in in-vivo OCT images of oral dysplasia in a hamster model . A recent pilot study in 27 patients confirmed the feasibility of using OCT to identify architectural changes in malignant cells but unfortunately, it could not provide a diagnosis or differentiate between lesions . Early diagnosis of oral cancer is a priority health objective, in which oral health professionals may play a pivotal role. Detection should lead to less damage from cancer therapy and to a better prognosis. There are also a number of novel techniques that may variously help in the diagnosis of oral malignancy. Lately, light-based detection systems have been claimed to improve sensitivity and specificity, but so far, controlled studies have failed to justify their application. Brush biopsy and scalpel biopsy are effective diagnostic tests for evaluating suspicious oral lesions which may be precancerous or cancerous. Light based screening aids should only be employed as an adjunct to the clinical examination for identifying oral lesions that may have been overlooked with a conventional oral examination and not for determining the biologic nature of a lesion. However, controlled trials in both high and low risk populations with histologic outcomes and critical appraisal from the medical community are required before they can be integrated into practice. The authors thank Alexei Doudkine (Oral Advance, Vancouver, Canada) for Figure 1d. RM conceived and researched the manuscript; DKG reviewed and finalized the manuscript.